Trends of mobile technology and business in the Asia-Pacific Region: An introduction; Mobile telecommunications and business in Australia: market overview and key emerging trends; The current state and future directions of the mobile technologies and business in China; Mobile business and services in Hong Kong: Its evolution, development and challenges; Japan: The leading mobile market at the crossroad; Mobile business in Korea; Trends in mobile technology and business in Malaysia; Mobile computing applications in New Zealand; Beyond mobile communications – ubiquitous information environments in Singapore; Taiwan as a mobile society: Policy, technology and societal challenges; Trends in mobile technology and business in Thailand; Conclusion. 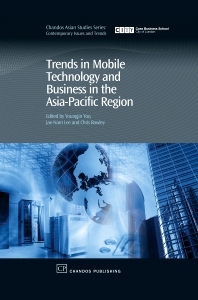 This book introduces trends and developments in the area of mobile technology and business in the Asia Pacific region – an area which has emerged as a hotbed for not only much economic development generally, but also the mobile revolution that is sweeping through the globe. Although mobile technology did not originate in the region, over the last decade mobile and wireless technologies and services have rapidly grown in this area. Some companies from this area are taking the leading roles in many aspects of industry (hardware, software and service) and international standard setting organizations as well. The book presents 12 in-depth case studies written by specialists covering many countries in the region in order to provide an evolutionary perspective on mobile technology and business. The book offers both macro-level public policy implications and firm-level strategy for this emerging technology. Dr Youngjin Yoo is Associate Professor and Irwin L. Gross Research Fellow in Management Information Systems department at the Fox School of Business & Management at Temple University, USA. Dr Jae-Nam Lee is Associate Professor of MIS in the Business School of Korea University, Korea.